ASTERIOS® is the unique market solution combining the benefit of an integrated development tool-chain with an exhaustive simulator, a new formal language, a time and space partitioned small footprint kernel with a time-triggered architecture model capable of deploying automatically the optimal deterministic scheduling policy for any given real-time application. 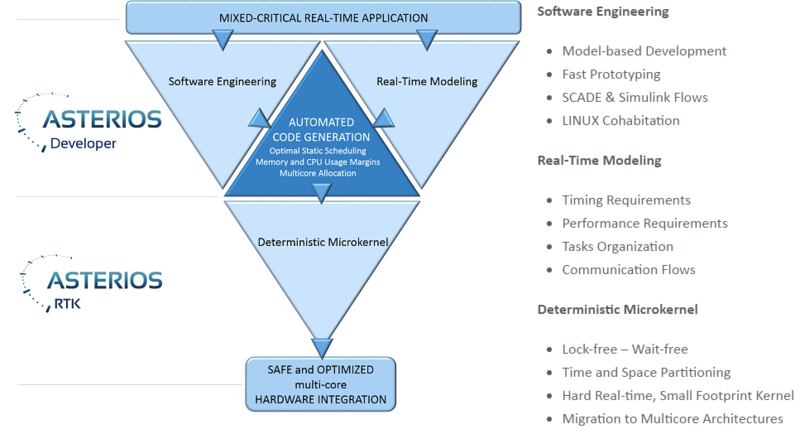 Software integration on a hardware platform is costly as it is the result of a long development phase including empirical methods to “fine tune” or “micro-design” the real-time application. Our ASTERIOS® solution performs this integration stage naturally and efficiently, while ensuring a high degree of determinism by construction.